Visitors come to Southwest Florida for its pristine white sand beaches, warm blue-green waters, and fabulous year-round weather, but much more awaits discovery. 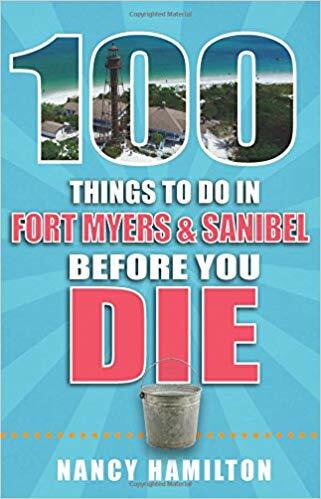 100 Things to Do in Fort Myers & Sanibel Before You Die proposes opportunities to explore not only the beaches, waterways, and recreational activities, but also the historic and offbeat locales. Get inspired at the Edison & Ford Winter Estates. Take time to go fishing, shelling, birding, or island hopping and fully appreciate this natural haven. Spot endangered West Indian manatees meandering through the mangrove-lined back bays and estuaries. 100 Things to Do in Fort Myers & Sanibel Before You Die will help point your life list in the right direction. Nancy Hamilton grew up exploring the shorelines of Michigan before she moved to the Fort Myers area of Florida. A Michigan State University journalism school graduate, she was lured to Florida by a job at the Naples Daily News. Currently, she works in the field of public relations and continues to find new and wonderful discoveries in her own backyard. The public is invited to this Library Program. There is no registration required and no additional cost to participate.